This sturdy wooden stand is our workhorse when we're filling bags for production. Our 2012 prototype (photo above) is still going strong after 5 years and tens of thousands of bags. It's made of fir and assembled with 3 1/2" decking screws. We rub it with teak oil and seal the ends with spar varnish to give it protection from the elements. It comes with a new traffic cone, which serves as a funnel to fill your bags. 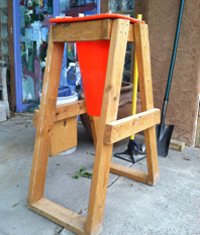 The box on top (into which the traffic cone/funnel is inserted) is sized to hold a standard 5-gallon bucket or a bucket sieve for sifting your soil & fine-screening your dirt to make your own plaster. The horizontal braces are placed to accommodate a shelf which will facilitate use by one person to fill bags. We make these stands 36" high. If you're taller or shorter, advise us and we can customize your stand's height to you at no additional charge. Waist-high is a good working height. If you want us to paint yours, or make it lighter (smaller dimensioned lumber), or construct one for you using nice hardwood, let us know and we can work something out. a hammer holster & rubber mallet for whacking stubborn fill material in the cone. The holster can also hold your bolt cutters when cutting lengths of barbed wire (add $10). barbed wire package (see photo) lets you use your stand to hold & unreel your barbed wire roll. This spares you and others from the dangerous whiplashing that can otherwise occur. Includes a length of steel conduit for use as a spindle or axle; metal plates screwed on the insides of the legs so the barbed wire won't shred the wood as you're reeling it out; retaining pins (so the spindle won't fall out of its holes); and clamps to store the spindle when it's not in use. (Add $30). This option is not compatible with the stepladder option. Barbed wire roll (and other things in the photo) are, of course, not included. Please note that your stand is made to order. We might need a week or two to get yours ready, depending on our schedule & the weather (we don't have an indoor workshop). For now, stands are local pickup or delivery. Because of the weight and the size, we've found shipping costs to run between $50 and $100. If you're willing to fork that out, let us know. We can pack it flat with simple assembly instructions (screwdriver and a crescent wrench required) to save you $$$ on freight.